May these poems richly bless and enhance your life and may God continue to bless and keep you,Inspiration by J.A.D.A. 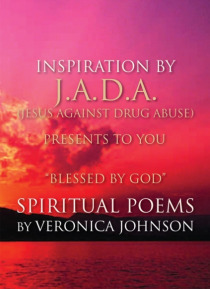 (Jesus Against Drug Abuse) is the name that came to me as I sat down to write these poems. In one night eleven poems poured out of my heart and onto paper. I will never forget the feeling that came over me as verse after verse came out of my heart. As I tearfully wrote the words do… wn I remember thinking that God has blessed me in such a way that I will never forget. I pray that when my poems find you, they will uplift your spirits and bless you by giving you a sense of hope for a better tomorrow.